Participation in sport and recreation always involves some level of risk of injury. There is no sport situation where there is zero risk. However the level of risk differs greatly from activity to activity. Some forms of recreation have a very low level of injury risk because there is no body contact, no quickness of movements required, no flying implements, no machinery and little exposure to the forces of nature. Playing cards or Chess are examples of such low risk activities. On the other hand there are a great many sport and recreation activities which have high levels of risk such as the various codes of Football, Cycling, Equestrian and Netball. 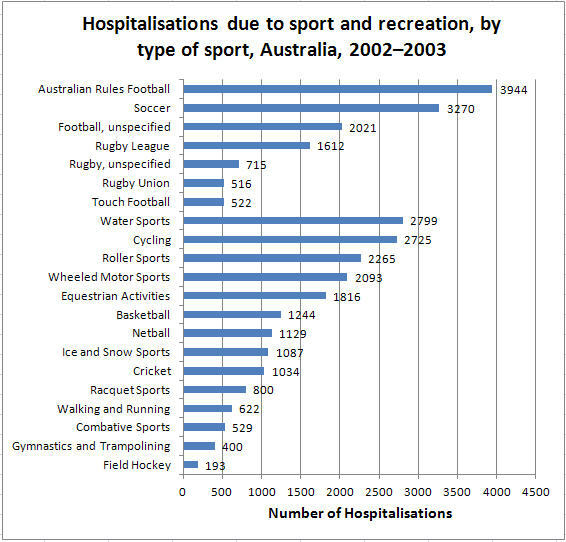 The following chart is an extract of a report authored by Louise Flood and James Harrison, Flinders University, on Hospitalised Sport Injury, Australia 2002-03. Anyone who has an official capacity to organise and manage sport programs and events has a duty to make such activities as safe as possible for anyone who participates. This duty is referred to, in the eyes of the law, as the "Duty of Care". Persons in an official capacity include coaches, referees, coordinators, club administrators, grounds caretakers and owners of the sport facility. Persons who participate include players, player supporters, spectators, coaches, referees and other officials such as time keepers and helpers. Supervise participants as they undertake sport activities particularly if they are children or have an infirmity. Ensure that there are persons on hand who can respond appropriately to emergencies. This usually involves the provision training and the development of procedure. The actions that sport managers and supervisors must take to make participation as safe as possible will depend, to some extent, on the participants themselves. The law tends to view that some people in society are owed a higher standard of Duty of Care as they are less able to look after themselves. This group includes children, persons with a disability, mentally ill, elderly and in some instances those who are pregnant. The Duty of Care principle was established in the famous case of Donoghue and Stevenson, 1932. In the many interpretations of this and subsequent cases, it has become a generally accepted principle that anyone (or any business) that makes a product or offers a service must contemplate the safety of the users of that product or service. In effect, if there is a risk that the user of the product or service will sustain injury, illness or other harm, then the product or service should be withdrawn until the product or service is remedied. If an individual or a business provides a product or service that they know to be unsafe, or recklessly fail to give any consideration of safety, then the individual or business runs the risk of a court action for NEGLIGENCE. Negligence occurs when there is a breach of the Duty of Care and someone is injured as a result. Participation in sport is an inherently risky business and many injuries and even deaths do occur. Provided that sport managers have carried out their Duty of Care, then there is no redress for participants if they are injured in the pursuit of a normal sport activity. They can insure for this if they wish. It is only possible to take action in court if there is a breach of the Duty of Care and it is often the case that such a breach occurs when something has been missed or overlooked. For this reason, there is great pressure on all sport organisations to undertake RISK MANAGEMENT. Children and/or other vulnerable segments of the population should be supervised when they participate in sport activities. Sport participants are appropriately prepared for the sport activities they undertake. This includes health checks, fitness training, coaching and knowledge of rules. Injured persons are withdrawn from participation as soon as the injury comes to light. Behaviour that may increase the possibility of injury is discouraged and action taken against persistent perpetrators of inappropriate behaviour. Establishing that the injured party was owed a Duty of Care is generally not the difficult aspect of any case in Negligence. It depends on proving that a relationship exists between the injured person and the person(s) held responsible. The following figure provides some examples of the persons who would owe a duty of care to a participant in a sport event. 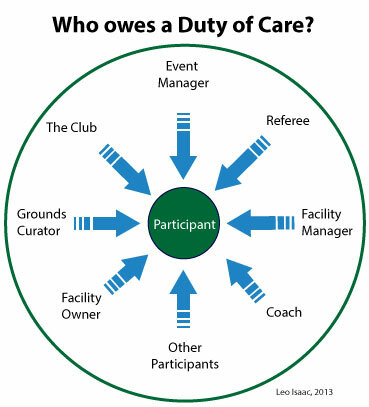 Note: The above illustration should not be interpreted as the full list of the persons or legal entities who might owe a Duty of Care to a sport participant. Establishing, in a court of law, that a breach of Duty of Care has occurred is a much more difficult proposition. The court will apply what might be termed as a 'test of reasonableness'. This involves a careful consideration of what is reasonable to expect a person (or organisation) to have done or not done in the circumstances. It would be unreasonable to expect that a sport organisation was flawless in carrying out all aspects of risk management. It is more a case that of what is reasonable to expect. For example, a flawless example of risk management might be that a football pitch was checked for glass or sharp objects by 20 people crawling on their hands and knees prior to the game. It would obviously unreasonable to expect this. It would, however, be reasonable to expect that the referee and linesmen did make one quick pass over the field to check for any hazards. Or it may be reasonable to expect that the grounds caretaker did repair the hole in the turf from last weekend's match. But a failure by the referee, or the grounds caretaker, or any club official to make any check of the playing surface would be a breach of the Duty of Care, and if someone is injured then there is potential for legal case for compensation. It is important to note and understand that there is no need to prove any intention on the part of the person held responsible for the accident. In other words, there is no defence in saying "I didn't mean to forget to check the playing surface" or " I didn't put that hole their deliberately"! If a court finds that an individual or a corporate entity has breached their Duty of Care, they are said to have been Negligent. Conduct that falls below the standard regarded as normal and desirable in a given community. For any law suit for Negligence to succeed, the person claiming compensation must prove that an injury has occurred as a result. Accidents that result in injury, need to be documented and physical injuries may be less difficult to document than psychologic injuries.